The program enables health workers to collect data about disease in their area using mobile phones. The partnership enables health workers to collect data about infection rates for malaria, cholera, measles, typhoid and other diseases in their area through mobile phones. The phones are connected to an Interactive Voice Response system that requires health workers to call in and answer a standard set of questions. The verbal system makes it easy for community health workers with varying levels of literacy to provide accurate data without having to read and decipher paper forms or key-in data. The Interactive Voice Response software automatically aggregates the data and sends text messages alerting officials of immediately observed diseases. 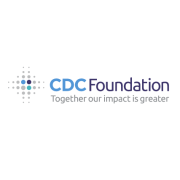 The CDC Foundation is an independent nonprofit and the sole entity created by Congress to mobilize philanthropic and private-sector resources to support the Centers for Disease Control and Prevention’s critical health protection work. They are a catalyst for unleashing the power of collaboration between CDC and philanthropies, private entities and individuals to protect the health, safety and security of America and the world. The government has unique capacities as well as limitations. The same is true for the private and philanthropic sectors. They believe that people, groups and organizations have greater positive impact and can accomplish more collectively than individually. By aligning diverse interests and resources and leveraging all parties’ strengths, the focused collaborations with private and philanthropic partners help create greater impact than any one entity can alone. Thesupport saves and improves lives—right now and in the future. Established by Congress as an independent, nonprofit organization, the CDC Foundation connects the Centers for Disease Control and Prevention (CDC) with private-sector organizations and individuals to build public health programs that make theworld healthier and safer. Since 1995, the CDC Foundation has provided $300 million to support CDC's work, launched more than 500 programs around the world and built a network of individuals and organizations committed to supporting CDC and public health. Each CDC Foundation program involves a talented team of experts at CDC and at least one outside funding partner. Sometimes, a program begins with a CDC scientist who has a great idea and wants to collaborate with an outside partner to make it happen. At other times, organizations in the private sector recognize that they can better accomplish their own public health goals by working with CDC through the CDC Foundation. The CDC Foundation helps CDC pursue innovative ideas that need support from outside partners. The support needed is most often funding, but also can include expertise, information, leadership or connections to specific groups of people. CDC Foundation partnerships help CDC launch new programs, expand existing programs that show promise, or establish a proof of concept through a pilot project before scaling it up. In each partnership, outside support gives CDC experts the flexibility to quickly and effectively connect with the right partners, information and technology needed to address a priority public health challenge. The programs are as diverse as the expansive role of CDC in the global public health arena. Each of the programs involves a talented team of experts at CDC and at least one outside funding partner. In today’s global economy, diseases have the potential to spread at warp speed. To protect the health of Americans and to address worldwide health threats, CDC is actively engaged in sharing knowledge and expertise in public health with international partners. The CDC Foundation helps CDC fight global health threats by fostering collaborations between CDC and other groups to support a variety of international health programs. Heart disease, cancer, diabetes, childhood asthma, obesity and other chronic conditions that affect us — and those they care about — now account for 70 percent of all deaths in the United States. Racial, ethnic and socioeconomic health disparities persist and widen. While CDC is best-known for fighting infectious disease outbreaks, CDC also provides the science that helps community leaders, employers and families battle chronic health threats by choosing and promoting healthy behaviors. The CDC Foundation helps connect CDC with foundations and businesses in the private sector that have a shared interest in promoting healthy life styles and preventing chronic diseases. Many infections, once though conquered, have reemerged in drug-resistant forms. Globalization — from air travel to food production — has opened new doors for bacteria and viruses to enter the U.S. One of CDC's most visible roles is identifying and controlling outbreaks of infectious diseases and protecting us from emerging infectious threats. The CDC Foundation provides opportunities for outside partners to support CDC's efforts and join in the fight. Preventable injury and violence are leading causes of death and disability. On one end of the spectrum, homicide is the second leading cause of death among young people between the ages of 10 and 24 years old. At the other end, falls are the leading cause of injury deaths and emergency room visits for seniors. CDC works to prevent unintentional injuries – from car crashes to senior falls – as well as injuries and death resulting from violence. The CDC Foundation helps connect CDC to outside partners that share CDC's goals of reducing injury- and violence-related death and disability through prevention. The places where people live, work and play can greatly impact their health. CDC conducts research that analyzes to what extent these possible environmental threats affect the health and who may be most at risk. The CDC Foundation helps CDC collaborate with universities and research institutions in the U.S. and around the world to investigate potential environmental health threats and make recommendations for how to mitigate their affects on the health. CDC is a key player in preparing the nation for large-scale public health emergencies — whether terrorist attacks, pandemic flu or natural disasters. CDC works with its partners at the national and local levels to develop and improve emergency preparedness plans that can be activated the moment disaster strikes. In addition, CDC experts are often among the first on the frontlines of a disaster, monitoring for potential disease outbreaks and assessing damage to healthcare infrastructures. The CDC Foundation has a number of funds and programs designed to support CDC's emergency preparedness and response activities. CDC's National Institute for Occupational Safety and Health (NIOSH) is the federal agency responsible for conducting research and making recommendations for the prevention of work-related injury and illness. NIOSH gathers information, conducts scientific research, and translates the knowledge gained into products and services, including scientific information products, training videos and recommendations for improving safety and health in the workplace.The CDC Foundation helps NIOSH collaborate with industry leaders, employers and research institutions to advance learning and effectively address occupational health threats. A key role of the CDC Foundation is to introduce CDC and public health to a range of individuals – from civic and corporate leaders to students. A number of Foundation-supported fellowships, training opportunities and educational exhibits help individuals and groups experience CDC and learn more about how they can be a part of the solutions to some of the greatest health challenges.